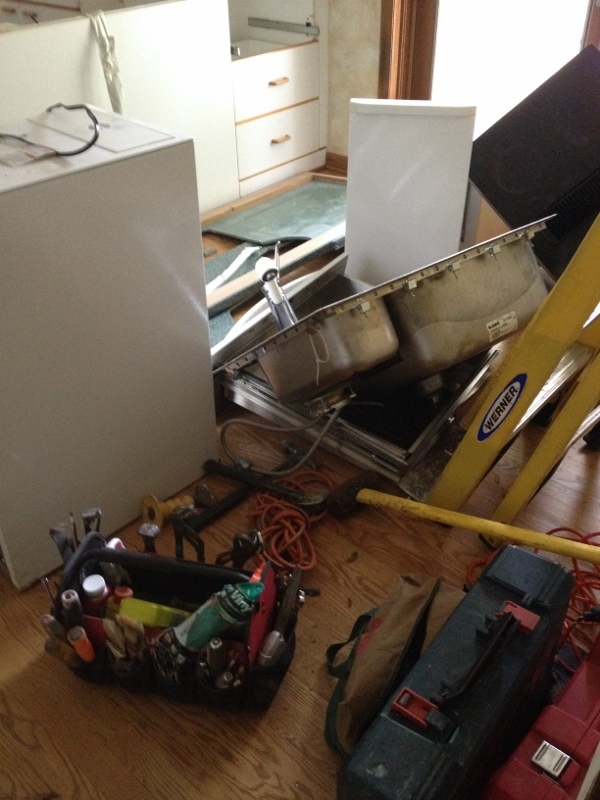 At 7:30 in the morning on Day One of the kitchen demo, there’s a knock on the door. It’s the hauling service with our dumpster. “Where do you want it?” What, seriously? I’m in my bathrobe. Do I look like the Project Manager? 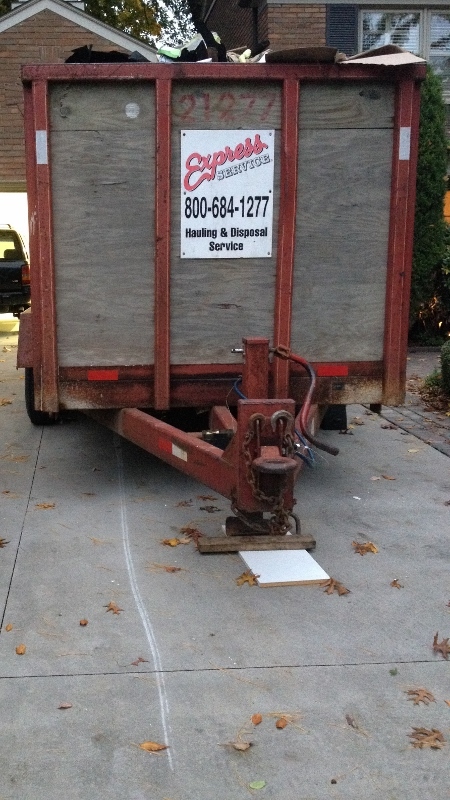 Anyway, we figured it out and the dumpster gets dragged on our driveway. At this point I’m thinking to myself, wow, that’s one big dumpster. I guess they don’t mess around. In the light of day (it was still dark when they came), there is a huge (I mean huge! Look at it!) scrape up our driveway. Turns out, it was in fact the wrong dumpster. We were supposed to get a smaller one with rubber tires (shown ). The demolition hasn’t even started and we already have collateral damage. 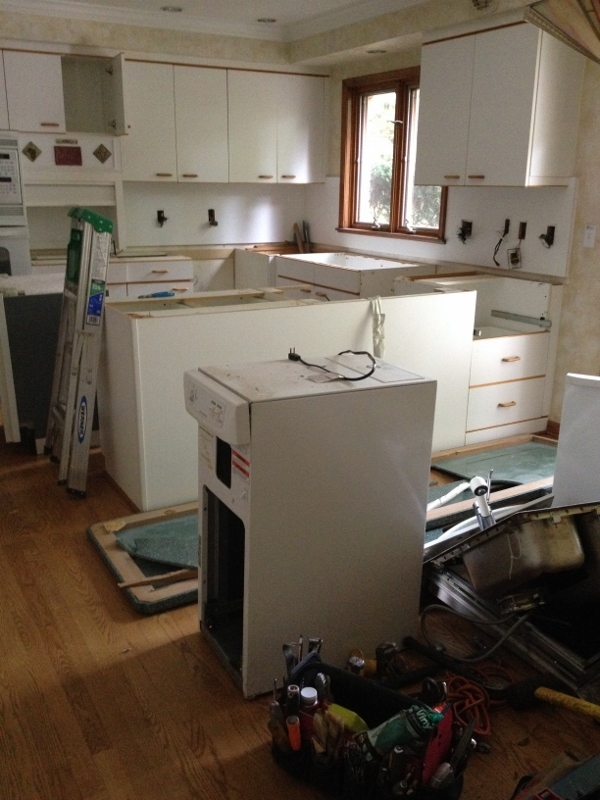 There was just one guy here (I met him, but am blanking on his name), taping off the doors (two doors, one leading from the family room to the entryway and the other between the kitchen and dining room), putting down cardboard and pulling the cabinets off the walls. This is what it looked like around lunch time (above). 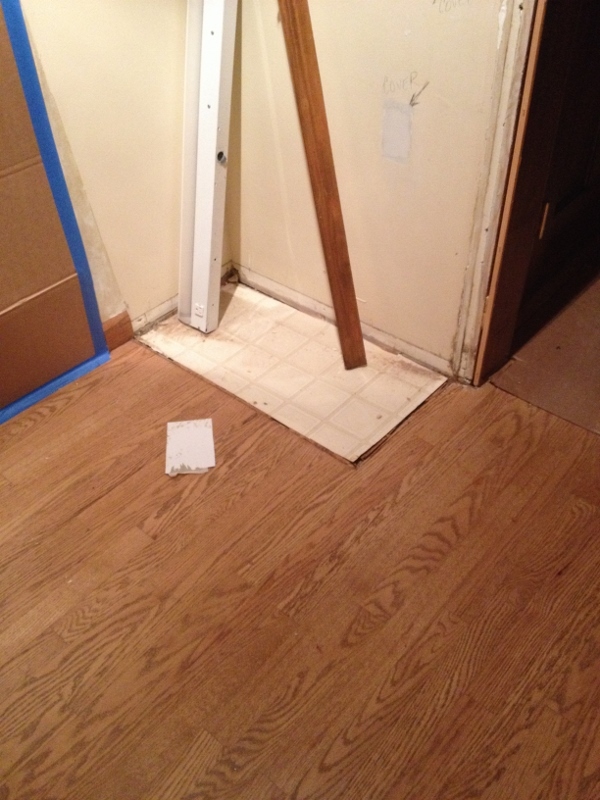 A patch of linoleum under the cabinet that was closest to the dining room. 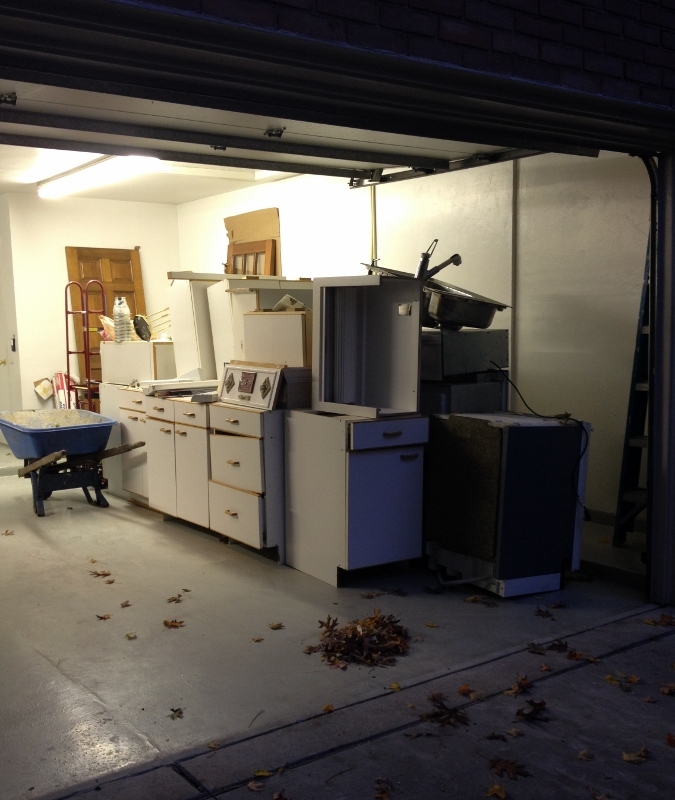 Our Habitat for Humanity donation stacked neatly in the garage. A few days before the demo, I posted on Facebook, asking for crock pot recipes. Maybe I didn’t have a kitchen, but I still had electricity, right? After just one day of demolition, I put the crock pot in the basement. It is not seeing the light of day until that kitchen is done. 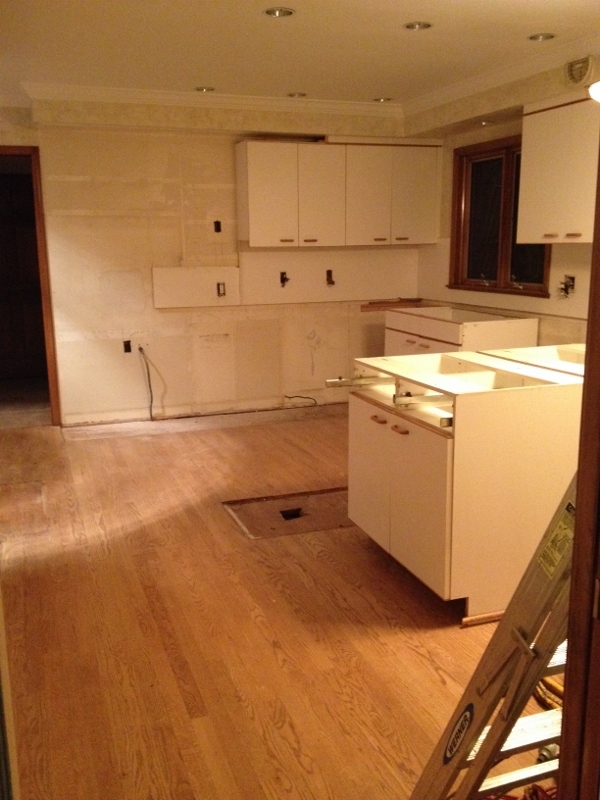 This entry was posted in Kitchen Remodel and tagged Demolition, Home Remodel, Home Renovation, Kitchen Remodel. Bookmark the permalink. Believe me, I know. Sometimes I feel guilty for talking about it even, but hey, I’m doing a lifestyle blog, not a humanitarian blog so…there ya go. The main thing is I’m grateful. Always practicing gratefulness (although sometimes man, especially on crazy days with the kids, it is HARD). I am with you! I wouldn’t cook any. Thing. Linoleum is a dirty word aye? Very cool you are giving the kitchen set away like that! Nice to have that finished garage, many garages in Michigan are just bare studs. Ha. No, linoleum can be very cool, I admit. It’s just not for us. Right now. Hehe. I seriously think we have the most pristine garage in all of Grosse Pointe (well, DID). My husband was all googly-eyed over it when he first saw it.